Hi! I am Marlene Wymenga and I live and own a quilt shop in the small town of Blenheim in Southwestern Ontario. We are approx. 10 min off of Hwy 401 between London and Windsor. I have worked as a dental hygienist for almost 30 years. After the dentist I was working with for 26 years decided to retire and sell the practice I decided now would be the time to pursue my passion of owning a quilt shop. I started Pastime Pieces as a online shop first, then renovated the basement in my home to receive customers. I soon outgrew that space so I opened up more space on the main floor of my home. In 2015-2016 we built my dream quilt shop. 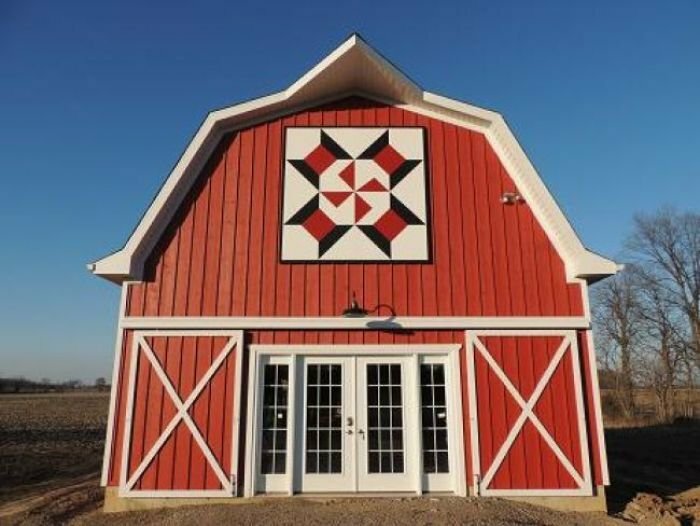 A 2 story red barn with upstairs loft used for classes. I enjoy designing and have designed some patterns for childrens' growth charts, baby quilts and my favorite wool applique projects. I have always loved keeping busy with my hands and thank God for the talent He has given me. As a young girl my mother and grandmother taught me how to knit, crochet, sew, embroider and the list goes on. I am thrilled that I get to do what I love every day. I thank my husband for supporting my adventure 100 %. I have been married to the same wonderful husband for 35 years. We have four children ( 2 girls, 2 boys) and 5 cute little grandsons.